On November 19, 1980, a small gathering of Orthodox faithful made a commitment to pursue establishing a new Greek Orthodox Church to serve the Orthodox community in Virginia Beach. From this inauspicious initial gathering, Saint Nicholas Greek Orthodox Church was born. In the ensuing months, a flurry of activity culminated in the hand-delivery of petitions from 121 households to the Archdiocese on March 4, 1981 requesting a charter for the new church. On April 5, 1981, the first General Assembly meeting for the proposed church was held at Plaza Junior High School, presided over by Rev. Father Theodore Chelpron. This meeting marked several extremely important events in the life of our church. First, Father Theodore presented the congregation with the initial parish charter. Also, the altar was set up for the first time. All those who attended became charter members of the new church. An interim parish council was selected, which included: President Thomas C. Kyrus, Vice-President Michael Savvides, Treasurer George Kotarides, Secretary Michael Katsias, George A. Christie, Peter Daikos, Sander Dukas, Bob Gabriel, Sotirios Karageorge, Louis Paulson, John Perros, Edward Redfearn, Constantine A. Spanoulis, Roshan Talreja, and Nicholas Theodoridis. The Rev. Father George I. Paulson, recently retired from the U.S. Navy and residing in Virginia Beach with his family, became our first parish pastor and the spiritual father of the fledgling congregation. The unique blending of talents- Father Paulson's charismatic and innovative leadership, the visionary and tireless efforts of the new leaders, and the boundless enthusiasm of the young congregation- created an environment where the transformation from the idea of a Virginia Beach Orthodox Church to the reality was only a matter of time. From there, events moved quickly. A choir was formed, under the direction of Elaine Kyrus. Acolytes were selected and trained under the tutelage of Fr. Paulson. Funds were raised and materials donated to transform Plaza Junior High School, our temporary location, into an Orthodox house of worship. Finally, on May 3, 1981, the first Divine Liturgy for the new Greek Orthodox Church was celebrated at Plaza Junior High School. At this Liturgy, the interim Parish Council was sworn in and the first confirmation took place. We also held our very first Sunday School and Bible Study classes. On May 24, 1981, Courtney Constantina Zinovis, daughter of Mr. and Mrs. Gus Zinovis, was the first baby baptized in our church. On May 31, the first General Assembly meeting, as a chartered parish, was held at Plaza Junior and by-laws were approved. On July 1, 1981, our Ladies Philoptochos Society was organized, with Thalia Tsantes elected as the first president. On July 19, 1981, Hershell Meadows and Maria Efstathiou became the first couple married in our parish. Formal communication was established early with the church community via a newsletter, edited by Louis Paulson, and the first issue was published on May 14, 1981. This newsletter became the crucial link between the congregation and the various efforts to provide for the new church in its formative stages. On October 11, 1981, the General Assembly unanimously approved a proposal to purchase a former roller rink on First Colonial Road to be the permanent site for the new church. On October 28, 1981, Metropolitan Silas authorized the purchase of the former roller rink and fund raising began in earnest for the new church. Through teamwork, dedication, and hard work, the new location was ready for its first Divine Liturgy celebrated on February 14, 1982. 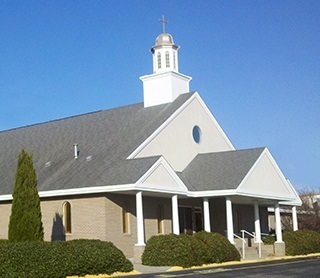 So, less than eighteen months after the group met to explore the feasibility of establishing a church in Virginia Beach, the new church, now named Saint Nicholas Greek Orthodox Church, existed. On April 17, 1982, Saint Nicholas celebrated its first Easter Service of the Resurrection at this new site. Not content to rest on these significant accomplishments, this humble community of faithful took on yet another serious and long-term commitment- this time to raise funds to build an entirely new church building on the First Colonial Road site. The history of the years before the new building was completed is a record of steadfast vision, stewardship, sacrifice, joy, and fellowship in working towards a common goal. For several years, the building fund drive included bake sales, fashion shows, dinners, lunches, craft shows, generous corporate donations, individual pledges, GOYA projects, special weekly collections, and other means to raise the capital necessary to build a permanent home for Saint Nicholas. Again, this hard work and commitment was rewarded when ground was broken for the new building. The building was designed and built by Greg Dragas, and a number of generous benefactors and individual contributors ensured the success of this endeavor. When our new building was completed, the roller rink structure was converted into our current fellowship hall. The first Divine Liturgy in our new building was celebrated on Palm Sunday, 1997. One of the innovative ideas implemented during this period was to offer commemorative bricks, inscribed with the names of loved ones and designed for display, to the congregation. These small commemorative bricks provide a means of showing support for the church and memorializing special members of the Saint Nicholas family. The bricks are mounted and displayed in the Narthex. The offering of these commemorative bricks continues today, a simple testimonial to the past, the present, and the future Saint Nicholas family. Saint Nicholas has been blessed with inspired spiritual leadership throughout its existence. From the very beginning, Father Paulson provided strong, learned, and innovative guidance- a strong Shepherd who guided the young church throughout its formative years. As pastor from 1981-2004, his impact on Saint Nicholas is profound and lasting. In 2004, Father Paulson became Pastor Emeritus. Our fellowship hall is named in commemoration of Father Paulson and his beloved Presbytera Evangeline, for their essential contributions to Saint Nicholas. Father Uhl and his family came to Saint Nicolas Greek Orthodox parish in 1983, where he served as lay assistant to the founding pastor, Father Paulson. In 1997, Rev. Father Savas Constantinou joined the Saint Nicholas family. In 1998, Father Sav became assistant pastor and Youth Director. In August 2004, Father Sav became the second pastor of Saint Nicholas. Sadly, on July 15, 2005, for medical reasons, Father Savas had to step down as pastor. Father Sav's contribution was more subtle, but no less important, providing needed continuity and stability during a transition period in our church's life. In August 2005, Rev. Father James Pavlow was assigned pastor of Saint Nicholas, bringing an energy, enthusiasm, and religious depth which has served the congregation well. In addition, for many years our Saint Nicholas family has included Rev. Father Bill Bartz, who has served our parish as his military duties allowed. Each of these Reverend Fathers has helped provide a ministry that is wise, strong, and committed. When all is said and done, a building is simply a building- it is the individual people and their steadfast commitment that form the heart and soul of a church. Whether it is supporting the Judeo-Christian Outreach Center, Saint Basil's Academy, Orthodox Missions, Holy Cross Seminary, disaster relief victims, or other charitable endeavors, the people of Saint Nicholas have always donated their time, talent, and energy to help others. This has never been done in pride, but to live as the Orthodox faith directs us. In truth, our church's existence is sustained and maintained by the individuals who contribute their time and effort daily to every aspect of our church life- our priests, the Parish Council, Philoptochos, our Sunday School teachers, our Choir, the Acolytes, those who organize and assist with dances and golf tournaments, those who prepare and serve special meals, bingo volunteers, those who adorn our church with flowers on holy days, those who organize fund drives, volunteers who help clean, paint, landscape, and maintain our building, administrators, and ushers- 25 years of doing what was needed to help others and help our parish. This, the 25th Anniversary of Saint Nicholas, is ultimately a testament to the vision, the commitment, and the sustained contributions of all members and friends of the Saint Nicholas congregation, past and present.